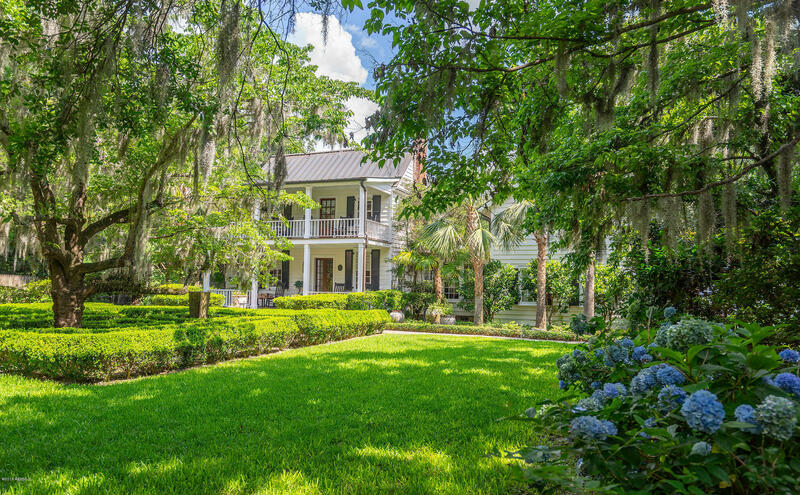 Located in the highly sought after point neighborhood, Petit Point sits on a very private half acre lot overlooking the Beaufort River and tidal marshes. The tranquil location offers grounds encased by a pierced brick fence, with intricate boxwood gardens and extensive landscaping. The house has been fully restored and offers four bedrooms and four and one half baths. A long bluestone slate walkway leads through the boxwood garden with slate fountains to a wide and welcoming porch, complete with gas lanterns.Upon entering, there are formal living and dining rooms flanking the foyer. The living room offers a fireplace and the dining room features a double height coffered ceiling. Off the living room is a light filled sitting room with beautiful views of the gardens and the river.